Sang Lee Farms, Inc. was established in the mid 1940's by Fred's Uncles, John (Kim Poy Lee), Hugh K. Lee and father, George Kim Lee. Following George's return from his Navy tour of duty during World War II, the farm began supplying New York's Chinatown with quality Asian produce grown in Melville, Long Island. The farm was expanded in the late 1950's to include year round production from Hobe Sound, Florida during the winter months. In 1964 the New York operation was moved to East Moriches, Long Island. Today, Fred and his wife Karen operate the farm with their son William and staff, growing more than 100 varieties of specialty vegetables, heirloom tomatoes, baby greens, herbs. They continue to feature Asian produce, growing many varieties of Chinese cabbages, greens, and radishes. 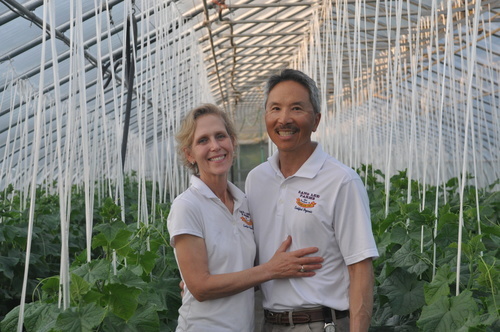 Sang Lee Farms is committed to growing organic, specialty, and heirloom varieties that thrive here in the Northeast. As a certified organic farm, Sang Lee Farms pays special attention to the quality and health of soil and water which directly affects the health, taste, and beauty of their produce. They also give great attention to the details of harvesting and handling of everything we grow. All of this contributes to the pure delicious flavors you enjoy from the North Fork.